Story by: Story and photos by SPC Edward Shevlin, - New York Guard. The Dine-In in full swing at the Lexington Avenue Armory. 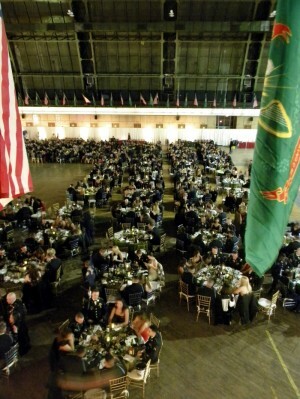 LEXINGTON AVENUE ARMORY, MANHATTAN, NEW YORK In the spirit of cooperation, and in keeping with its mission of force augmentation for the New York National Guard, elements of the New York Guard’s 88th Brigade turned out on 10 December 2016 to support the 69th Infantry Regiment as they celebrated their First Annual Holiday Ball “Dine-In” at their historic Armory on Lexington Avenue in Manhattan. The New York Guard cadre provided security and hospitality services for their hosts from 1800 2330 hours as the National Guard soldiers enjoyed a well-deserved evening of celebration and camaraderie. The essential services provided by the soldiers of the New York Guard 88th Brigade allowed an equal number of National Guard soldiers to relax and enjoy the evening, thereby exemplifying the force augmentation principle of the relationship between these two entities. As the evening began, the Commanding Officer of the “Fighting 69th”, LTC Don Mackay personally thanked each member of the New York Guard cadre for their support of his unit.